Graduate Program in Environmental and Experimental Pathology, Paulista University, R. Dr. Bacelar, 1212, Vila Clementino, São Paulo, SP, 04026-002, BRAZIL. Facultad de Ingeniería Química y Textil de la Universidad Nacional de Ingeniería, Av. Tupac Amaru 210, Rimac, Lima, PERÚ. Graduate Program in Dentistry and Center for Research in Biodiversity, Paulista University, Av. Paulista, 900, 1 andar, São Paulo, SP, 01310-100, BRAZIL. The present work reported the antioxidant and chemical screening of Brazilian plant aqueous and organic extracts. An amount of 895 Brazilian Amazon aqueous and organic plant extracts were tested in thin layer chromatography plates (TLC) using 2, 2-diphenyl-1-picrylhydrazyl (DPPH), β-carotene, Dragendorff’s reagent, Kedde’s reagent, and KOH reagent so as to evaluate antioxidant activity and chemical profiles. Antioxidant and DPPH free radical scavenging activities results were submitted to chi-square analyses. Only 8.60% of the extracts showed β-carotene/bleaching response, while 96.09% of the extracts responded as a radical scavenger, alkaloids occurred in 8.0% of the extracts whereas anthraquinones occurred in 0.89% of the extracts and cardenolides in 3.89% of the extracts. Present findings described that Amazon plant extracts have a huge potential to be a source of antioxidant compounds to be used in preventive medicine, as well as the chemical screening revealed that their plants can be strategically assessed as a source of alkaloids to be tested in further biological assays. Plant material was collected under Brazilian Government law, according to official documents #14895 [MMA/ICMBio/SISBIO] and #012A-2008 [IBAMA/MMA/CGen]. Plants were collected in the Amazon rain forest, (02° 23’ 41” S 60° 55’ 14” O); Manaus and Novo Airão, Amazonas, Brazil, and in the Atlantic Rain Forest, (24° 35’ 30” S 47° 27’ 7” O), Southern coast of the State of São Paulo, Brazil. Different parts of the plants were obtained (stem, leaf, flowers, fruits or roots), according to their biomass availability. Botanical material (i.e., vouchers) was collected and stored following the standard recommendations for botanical collections. Vouchers numbers are given in Table 1; all vouchers are deposited at the Herbarium UNIP. The botanical determinations were done in laboratory, with aid of taxonomic keys and specialist expertise. Thin layer chromatography silica gel GF254 plates (Merck®) were used in the analysis. Two mobile phases were chosen to be used12 ethyl acetate: formic acid: acetic acid: water (100:11:11:26) and ethyl acetate: methanol: water (100:35:10). β-carotene,15 (B) 2,2-diphenyl-1-picrylhydrazyl (DPPH) were used as reagents. The evaluation of the free radical scavenging analyses were made by the establishment of scores as strong (++++), very good (+++), good (++), weak (+) and absence of free radical scavenge activity (0).16 The following reagents were used in the chemical analysis:11 (C) Dragendorff’s reagent, (D) 5% KOH diluted in ethanol for checking the presence of anthraquinones; (E) Kedde’s reagent. 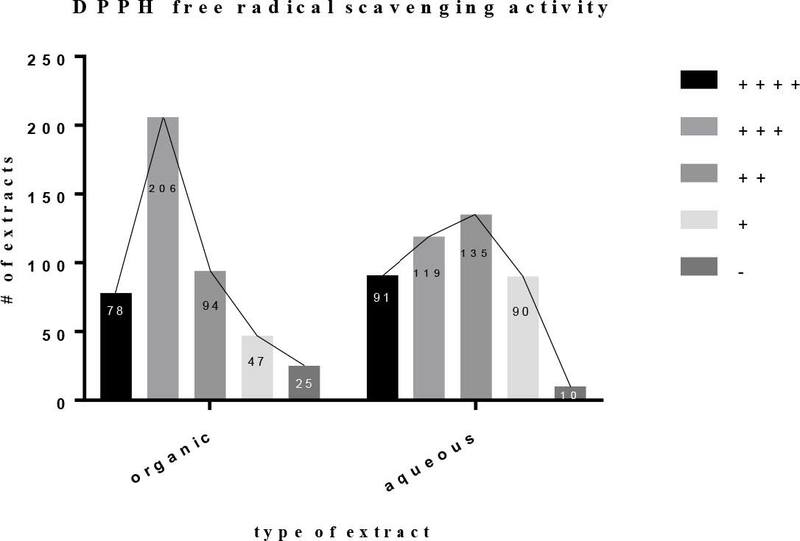 Pearson’s χ2 test was applied to evaluate the occurrence of antioxidant activity and free radical scavenging activity for both the organic and aqueous extracts, with α = 5%.17 The analysis of free radical scavenging activity was performed to determine different grades of intensities with scores from 0 (absence of free radical scavenging activity) to 4 (strong free radical scavenging activity; Figure 1). The chemical results are expressed as percentages. DPPH free radical scavenging activity of the 895 plant extracts tested in by thin layer chromatography analysis. In the present work, 895 plant extracts divided in to 450 organic extracts (50.28%) and 445 aqueous extracts (49.72%) were analyzed. It was observed that 77 (8.60%) of 895 plant extracts showed antioxidant activity in the β-carotene/bleaching assay (Table 1). Beta-carotene/bleaching assay tends to identify compounds that can chain-break free radical reactions, particularly initiated by light exposition and that consequently protect β-carotene from suffer radical reaction, such as compounds having phenolic rings and hydroxyl groups. Botanical identification of the plant material used to obtain the extracts tested for alkaloids (Dragendorff’s reagent), anthraquinones (KOH reagent) and cardenolides (Kedde’s reagent),).Legend: RA=roots; CA=stem; CS=stem bark; FO=leaves; AO=aerial organs; FR=fruits; PL=entire plant; LI=liana; odd numbers= organic extracts; even numbers= aqueous extracts. Moreover, 860 of 895 plant extracts showed radical scavenge (RS) activity in DPPH assay (Table 1), and astonishingly, it represents 96.09% of the tested extracts. Only 35 extracts showed absence of RS activity in the present assay, from those 25 were organic (71.42%) and ten were aqueous (28.57%). Although not possible to be quantified by the adopted TLC method, the level of RS activity of the extracts received scored so as to conduct chi-square analyses. So, 169 out of 860 (19.65%) plant extracts showed strong (++++) RS activity, while 325 (37.79%) showed a very good (+++) RS activity, 229 (26.62%) showed a good (++) RS activity and 137 (15.93%) showed weak (+) RS activity (Figure 1). Among the strong RS extracts scored with (++++), 78 (46.15%) of them are organic extracts and 91 (53.85%) are aqueous extracts. Among the extracts scored with (+++), 206 (63.38%) are organic extracts and 119 (36.62%) are aqueous extracts. Among the extracts scored with (++), 94 (41.05%) are organic extracts, while 135 (58.95%) are aqueous extracts. Finally, among the extracts scored with (+), 47 (34.31%) are organic extracts, and 90 (65.69%) are aqueous extracts. It was possible to observe that the 860 plant extracts with RS activity was split into two groups of 425 organic extracts (49.42%) and 435 AE (50.58%) each. It was also observed that the group of active extracts that has been tested in the present work showed important RS activity, for their responsiveness was mostly scored as (++++) or (+++) (Figure 1). Table 2 shows χ2 analyses based on the scores obtained in the antioxidant and in the radical scavenge analyses. The null hypothesis (H0) represents the equality of radical scavenge activity in both organic and aqueous. Pearson’s χ2 test was performed for both organic and aqueous extracts, and the hypothesis H0, that both extracts would have an equal distribution of (1) activity and (2) no activity in the β-carotene/bleaching assay (χ2 (1) = 831.40, p = 0.05; quantiles of the χ2 distribution with degrees of freedom [df] =1 and α = 5% were 3.84), indicating that hypothesis H0 could be rejected; so both extracts did not behaved the same. Pearson’s χ2 analysis was performed for both organic and aqueous extracts, showing that although the hypothesis was that both extracts would show an equal distribution of activity and no activity in the DPPH assay, a significant difference was found between these types of extracts (χ2(4) = 527.53, p < 0.05; quantiles of the χ2 distribution with df = 1 and α = 5% were 9.49), indicating that hypothesis H0 could be rejected, meaning that the organic and aqueous extracts behaved differently, and the organic extracts were more likely to present free radical scavenging activity than the aqueous extracts. Contingency table related to Pearson’s χ2 test conducted with plant extracts submitted to the evaluation of antioxidant activity in the β-carotene assay and to the DPPH free radical scavenging assay. Seventy three plant extracts, or 8.16%, presented alkaloids (Table 2). According to a chemosystematic approach, some groups of plants are more likely to biosynthesize alkaloids. So, in the present work alkaloids were found in the following families, which has been shown to present this class of compounds as cited: Annonaceae, Apocynaceae, Bignoniaceae, Capparidaceae, Chrysobalanaceae, Clusiaceae, Convolvulaceae, Euphorbiaceae, Celastraceae, Lauraceae, Fabaceae, Olacaceae, Piperaceae, Rubiaceae, Rutaceae, Sapindaceae and Solanaceae. Eight (0.89%) plant extracts obtained from plants of the families Apocynaceae, Capparidaceae, Lauraceae, Fabaceae, Rubiaceae and Rutaceae, showed positive reactivity to KOH reagent, indicating the presence of anthraquinones (Table 2), which has been shown to present this class of compounds as cited. Lastly, 35 (3.89%) plant extracts obtained from plants of the families Anacardiaceae, Apocynaceae, Clusiaceae (including Vismia - Hypericaceae), Combretaceae, Euphorbiaceae, Gentianaceae, Lauraceae, Fabaceae (subfamily Caesalpinioideae), Fabaceae (subf. Faboideae), Fabaceae (subf. Mimosoideae), Meliaceae and Myrtaceae that showed positive reaction to Kedde’s reactive, indicating the possible presence of cardenolides (Table 2), which has been shown to present this class of compounds as cited. The search for new medicines from natural sources has developed rapidly in the last half century due to the introduction of high-throughput biological and phytochemical screening assays that enabled analyses of large amounts of samples bypassing traditional time-consuming techniques.14 In the present work, plant extracts were obtained from Brazilian plants. The collection strategy was based on chemotaxonomic approach, as well as an eventual collection of a random species, especially if they were in the reproductive phenophase. As a general rule, plants used in traditional medicine were not our main target, but eventually they were collected in the field. Also, plant parts can vary in terms of their chemical constituents, and for that reason, collecting different organs of the same plant was done in order to obtain a significant amount of the chemical substances produced by the plant. Collection of terra firme trees are hard to perform as it depends on safety equipments and training in climbing techniques, so it is likely to have aerial parts being collected, once trees canopies can eventually reach 50 m tall. For that reason, aerial parts have been collected for trees. Also, in terms of ethics in accessing the Brazilian genetic patrimony, collections have to be performed in order to keep physiology of the plant as functional as possible, so, a limited portion of each plant material was collected, rarely the roots of the plants. The Amazon rain forest, one of the tropical rain forests located in Brazil, is under the constant influence of sun radiation all the year around, in contrast, temperate forests perceivethe clear temperature change depending on seasonality. Also, there is an elevated amount of precipitation in tropical forests. As a result, such climate conditions favours a warm and umid climate that prepossess the occurrence of high levels of biodiversity, including all organisms, particularly the plants. It is expected that the constant high levels of sunlight irradiation, including UV wavelengths, particularly UV-B, may produce free radicals within the plant tissues, and in a direct response to this phenomenon the plant organism is stimulated to produce more enzimes related to the production of specific secondary metabolites, as phenolic compounds and flavonoids to work as antioxidant molecules protecting noble molecules as DNA, RNA and lipoproteins.18 For that reason, the Amazon rain forest is one of the main spots on the planet where chemical and biological screening programs are the easiest and cheap ways of identifying plants as a potential source of new medicines. The present work reports the chemical screening of 895 plant extracts aiming the identification of their antioxidant potential, as well as to look for alkaloids, quinones19-20 and cardenolides derivatives,21 which are compounds already related to antioxidant activity. wo chi-square (χ2) analyses were performed to evaluate the occurrence of antioxidant and radical scavenge activities in both groups of organic and aqueous extracts. The H0 was considered as the equal distribution of antioxidant activity or radical scavenge activity in both organic and aqueous extracts. As our results for antioxidant ((χ2(1) = 8.58, p = 0.05; quantiles of the χ2 distribution with degrees of freedom [df] =1 and α = 5% were 3.84) and radical scavenge activities ((χ2(4) = 51.53, p < 0.05; quantiles of the χ2 distribution with df = 4 and α = 5% were 9.49) respectively, and when such results are compared to given quantiles (χ2 = 3.84 and 9.49 respectively, for df = 1 and 4 respectively, and α=0.05% for both analyses), it is easily noticed that the nule hypothesis can not be confirmed, and we can state that the occurrence of antioxidant and radical scavenge activities are different between organic and aqueous extracts. The present findings suggest that plant extracts made with organic solvents are more likely to present a wide range of possible antioxidant and radical scavenging active compounds, and are in accordance with previous results,22 who evaluated the effect of the use of methanol, ethanol and water in different compositions to extract phenolic compounds from plants and compared the efficacy of these extracts in antioxidant and radical scavenge in vitro models. In the present work, TLC techniques were adopted. Despite limitations of TLC assays being applied to screen for antioxidant and to prospect for the presence of phytochemicals, it is easily established in any laboratory and is approved by the World Health Organization for the quality control of plant-derived drugs. Anthraquinones were found in a few plant extracts belonging to Apocynacae, Lauraceae, Fabaceae, Rubiaceae and Rutaceae. All the extracts have also shown a good radical scavenge activity. Cardenolides were found mainly in the extracts that belong to Fabaceae, followed by the extracts belonging to Apocynaceae. These extracts have also shown significant radical scavenge activity. A β-carotene/bleaching response was found in 77 plant extracts. Eighteen extracts belong to Apocynaceae, and have also showed an expressive radical scavenge activity. Present findings described that Amazon plant extracts have a huge potential to be a source of antioxidant compounds to be used in preventive medicine, as well as the chemical screening revealed that their plants can be strategically assessed as a source of alkaloids to be tested in further biological assays, both aiming treatment and prevention of diseases. The authors thank Fundação de Amparo à Pesquisa do Estado de São Paulo – FAPESP for grant #2008/58706-8. - 895 Brazilian Amazon aqueous and organic plant extracts were evaluated by their free radical scavenging and antioxidant activities;-plants were also evaluated for the presence of alkaloids, cardenolides and anthraquinones;-present findings described that Amazon plant extracts have a huge potential to be a source of antioxidant compounds and a source of alkaloids to be tested in further biological assays. Cite this article: Marin LC, Cavarsan ECM, Díaz IEC, Paciencia MLB, Frana SA, Ivana B. Analysis of Brazilian Plant Extracts as Potential Source of Antioxidant Natural Products Using Bench-Top Assays. Free Radicals and Antioxidants. 2018;8(2):120-9.